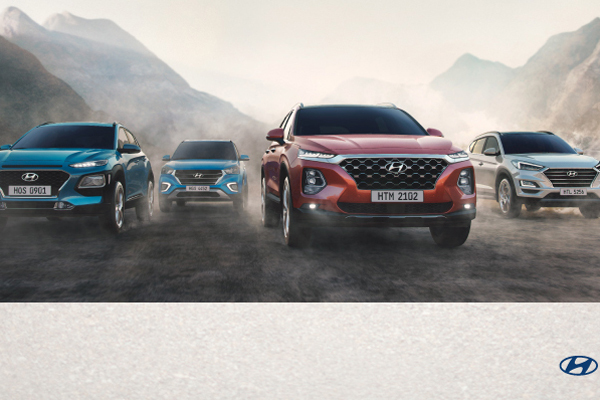 Juma Al Majid Est, the exclusive distributor of Hyundai Motors in the UAE, said it is offering best deals on the 2019 models of Hyundai that will delight customers. With its 2019 line-up of cars, all offering exceptional performance and with elegant features, Hyundai will delight motorists with the unprecedented price offers on its SUVs and passenger cars - Veloster, Sonata, Elantra, Creta, Kona, Sante Fe and Tucson, it said. Customers can ride home in a new Veloster with a monthly instalment of just Dh979 ($266.5), the Sonata can be owned for just Dh1,135 ($309.01) per month and a 2019 Elantra for only Dh879 ($239.3), it said. The SUVs are also cost-competitive with Creta priced from Dh57,200 ($15,572.9); Kona from Dh59,800 ($16,280.8); Santa Fe from Dh89,800 ($24,448.5) and the 2019 Tucson from Dh71,800 ($19,547).